Though the pen name on my mysteries is “Vick Reed,” when I’m in New Jersey with my family, I’m plain old Victoria Rienzi. For a couple of months now, I’ve been back in Oceanside Park along the Jersey shore, the town where I grew up. I have a history here, with my family, of course, but also with my ex-boyfriend, Tim Trouvare, who’s the sous chef at my family’s restaurant. I’ve also been involved with a couple of real-life mysteries since I’ve been back—murder seems to follow me wherever I go. But right now I have other things on my—if you’ll pardon the expression—plate. 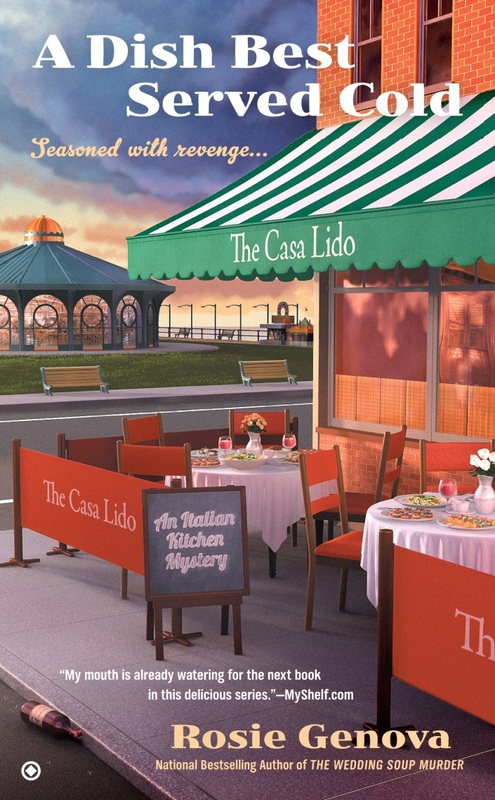 Our restaurant, the Casa Lido, is celebrating its anniversary this summer, so we’ve got a big shindig planned out in the garden behind the restaurant. We’ll be serving some of our famous dishes, as well as my father Frank’s famous homemade wine. We’re hoping things will go smoothly, but there are a couple of small hitches. For one thing, there’s a hurricane in the forecast. My grandmother, who brooks no opposition, won’t hear of moving the party inside. But as the wind whips up and the sky gets darker, I wonder how long we’ll be safe outside. And there’s another troublesome complication in the form of Pietro Petrocelli, also known around town as “Stinky Pete.” Pete’s just a little too fond of the grape, and he has a bad habit of showing up at the restaurant uninvited. We’re under strict orders not to give him any wine, but he always manages to find a bottle or two. Is he sneaking into our wine cellar? Or is there someone else interested in getting Pete drunk for reasons of their own? Because Pete claims to know things—about people around town, about their professional and personal lives, and about an old murder case that reaches back to 1940s Atlantic City. A cold case that holds a lot of fascination for me, even though I’ve promised my family to keep my nose out of it. So I hope you’ll wish us luck for our Casa Lido anniversary party. I can’t imagine that anything will go wrong this time—if you don’t count an impending hurricane and a nosy homeless guy who collects information on the wrong people. 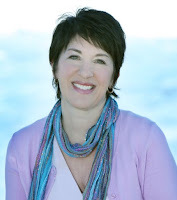 . .
A Jersey girl born and bred, national bestselling author Rosie Genova left her heart at the shore, which serves as the setting for much of her work. Her series, the Italian Kitchen Mysteries, is informed by her appreciation for good food and her love of classic mysteries from Nancy Drew to Miss Marple. Her debut novel, Murder and Marinara, was named a 2013 Best Pick by Suspense Magazine and was a finalist for a 2014 Daphne Award. Her current release is Book 3 in the series, A Dish Best Served Cold. Rosie still lives in her home state with her husband and the youngest of her three Jersey boys. You can learn more about Victoria (and her creator, Rosie Genova) at her website and on Facebook. Thanks, Janet (and company) for hosting Victoria and me today! Love Italian food - having lunch at a local Italian restaurant with fellow cozy mystery lovers today. Am definitely adding this one to my TBR list. Thanks to both of you. Thanks, Susan! And enjoy your lunch! Good luck on the outdoor party! You have enough problems for 2 or 3 plates. Great sounding series. 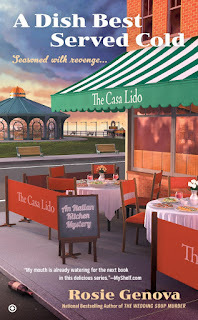 Something is rotten in the restaurant of Casa Lido and it s more than Stinky Pete. Nice teaser! Something served cold is perfect for the hot summer days. Thanks for Vickie's perspective. I enjoyed the first two books in this series and look forward to reading this latest one. It's good I don't work in a bookstore anymore, or even live anywhere near one, I would never have any money for groceries! The books all look very good! I will be buying this book Friday.